These quinoa breakfast cups are delicious and filling—each one is dense, so it only takes one (or, ok, maybe two) to satisfy morning hunger. You can eat them like a muffin, or break one up in a little bit of warm almond milk and eat it like oatmeal (I did this one morning and loved it!). Preheat oven to 375 degrees. Lightly grease a muffin tin (I use olive oil). Cook the quinoa. Bring ¾ up water to a boil, pour in ½ cup dry quinoa, reduce to a simmer until fluffy—about 12 minutes. Mix applesauce, mashed banana, almond milk, honey and vanilla in a bowl. Mix dry ingredients (quinoa, oats, cinnamon) in a separate bowl. Slowly stir the wet into the dry until fully combined. Peel core and chop up an apple. Mix the apple chunks into the bowl. 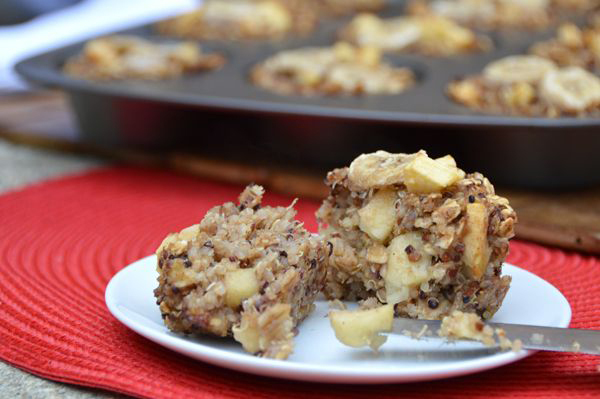 Fill each of the muffin cups to the top with the quinoa mixture. Add a banana slice or two to the top of each. Let cool for 5 minutes, then enjoy one warm! Store in an airtight container in the fridge. Reheat leftovers in the microwave before eating. You can also add some crushed pecans or walnuts to these--experiment!